In one of the highest towers in Hogwarts, Albus Dumbledore kept his office. A quiet retreat and study for the sage Headmaster. 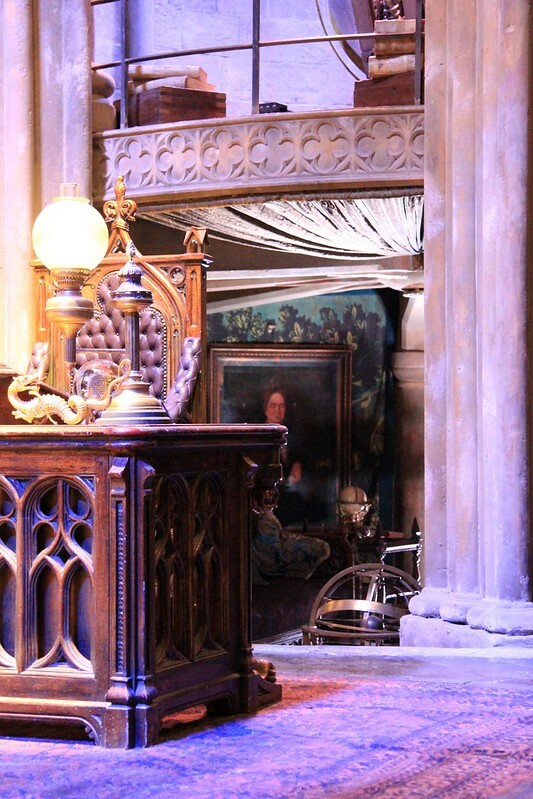 Dumbledore’s fascination with the universe and the heavens led production designer Stuart Craig to lean toward astronomy as the room’s defining feature. For Harry Potter and the Prisoner of Azkaban the script called for a new Hogwarts classroom where Harry could practise advanced magic with Professor Lupin. Instead of constructing an entirely new set, this room was redressed by replacing the books with even more scientific instruments. The sword was purchased from a prop company and the hilt was then recreated based on a number of other sword designs. The office features 48 portraits of sleeping Hogwarts Headmasters which were painted from still photographs of the actors. Hundreds of books cover the shelves of Dumbledore’s study which are actually British phonebooks covered in leather. Dumbledore kept his memories, as well as those he had gathered from other wizards, inside this cabinet filled with more than 800 tiny handmade and hand-labelled vials. This enchanted basin was used by Professor Dumbledore and Harry to revisit distant memories. To create this magical effect, the Visual Effects Department digitally replaced a greenscreen inside the basin with a pool of reflective liquid. Standing at the top of the stairs; as worn by Richard Harris in Harry Potter and the Philosopher’s Stone. Next to his desk; as worn by Michael Gambon in Harry Potter and the Half-Blood Prince. Image published by Karen Roe on 2012-06-15 18:54:06 and used under Creative Commons license.